Safely refill SodaStream cylinders from a larger donor cylinder. Refill SodaStream cylinders used in UK / USA / Europe (Rest of World), or in Australia / New Zealand. Works on *all* types of SodaStream cylinder valve, including the 'booby-trapped' model which supposedly prevent refilling. SodaStream isolation feature for safe removal of cylinder. Dump / purge valve for safe and controlled release of gas. Integrated pressure gauge for safety and display of donor cylinder pressure. On / off knob for controlled release. Highest possible quality design and manufacture. Our SodaStream Cylinder Refilling Adapter gives you the freedom and ability to refill your SodaStream cylinders at a fraction of the price you pay for exchanging at a retailer. The refilling adapter is used to safely refill SodaStream cylinders from larger donor cylinders. It is designed to connect to either a CGA 320 or DIN 477 / W21.8 / BS 341 No. 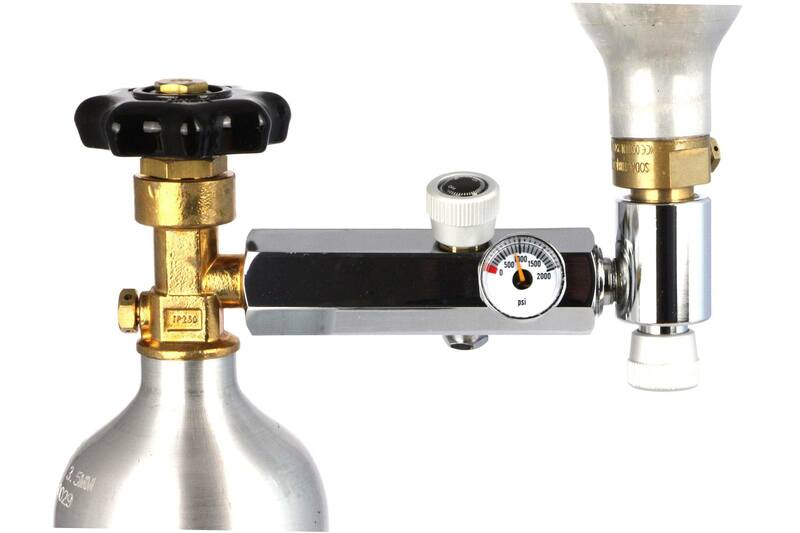 8 donor cylinder, and then connect either directly to the SodaStream cylinder or via a optional high pressure hose as shown in the product photos. Customer safety is always our primary consideration when designing new products, which is why our refilling adapter includes a pressure gauge to ensure the pressure of the donor cylinder will not exceed the pressure specification of the recipient cylinder, a on/off knob for easy and direct control of the refilling process, and a dump / purge valve to eject the residual gas within the connection between donor and recipient cylinder once refilling is complete. Screw the SodaStream adapter into the refill adapter. Screw the SodaStream cylinder into the adapter. Turn the knob of the SodaStream valve to inject gas into the cylinder. You will hear gas flowing into the cylinder. Refilling takes roughly 30 seconds. Isolate the SodaStream cylinder by turning the adjuster knob. Remove the SodaStream cylinder from the adapter. Repeat the refill process for each SodaStream cylinder. Simply top product. Works without problems !! Simply top product. Works without problems !! Fantastic product, great quality and easy to use. Fantastic product, great quality and easy to use. This is an awesome product. Very well built and nothing cheap about it. The customer service is amazing, thanks Martin for answering all and my many questions. I am filling cylinders with the booby-trapped one way values and this is a bit tricky. The success in filling these is not related to the adapter but in practice and getting a feel for it. You need to let in only a very small stream a of Co2 read more... This is an awesome product. Very well built and nothing cheap about it. The customer service is amazing, thanks Martin for answering all and my many questions. I am filling cylinders with the booby-trapped one way values and this is a bit tricky. The success in filling these is not related to the adapter but in practice and getting a feel for it. You need to let in only a very small stream a of Co2 at first and then very slowly increase the stream. If you release the C02 too fast then the one way value will stop the flow into the Sodastream cylinder. I found it was best to not open the value "E" fully and to only use valve Knob "B" to control how much C02 is released having the valve Knob "E" already open before starting but only slightly. As others have said, freezing the Sodastream cylinder is necessary for a few hours and I also found making sure my host cylinder is warm enough to provide 900 to 1000 PSI ... I think it would be great if this website had a FAQ page. A very good product, problem is the connection to the master cylinder thread. Depending on the bottle thread, the adapter is not always in the same position when tightened. A very good product, problem is the connection to the master cylinder thread. Depending on the bottle thread, the adapter is not always in the same position when tightened. Top quality, easy to use, does the job very well. Top quality, easy to use, does the job very well. Super works perfectly! Just good. Super works perfectly! Just good. Seems well engineered and manufactured, its orientation, when fitted and tightened, can vary from the photos on the website, depending on the length you thread on the donor gas bottle. Works well to refill 60 litre Soda Stream cylinders when used in conjunction with the connection hose - I haven’t ussed without. Seems well engineered and manufactured, its orientation, when fitted and tightened, can vary from the photos on the website, depending on the length you thread on the donor gas bottle. Works well to refill 60 litre Soda Stream cylinders when used in conjunction with the connection hose - I haven’t ussed without.